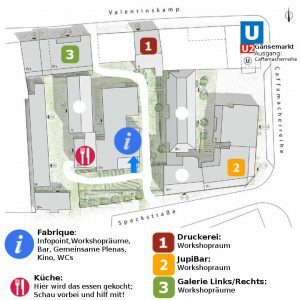 We are looking forward to having the Lelka & Mania Workshop Days take place at the Gängeviertel. The Gängeviertel as we know it exists since 2009. Back then, a group of over 200 people tried to save the houses from being demolished. Since then, the Gängeviertel has become a lovely and colorful place which houses countless events, concerts and discussions. The Workshop Days were also prepared in one of its small rooms.